Welcome to the garden - the Jellypop Garden Platform Sandal that is. 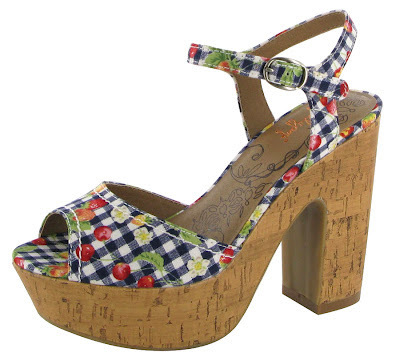 Get nostalgic in this adorable vintage inspired sandal with an earthy platform and block heel. A perfect accent for any spring look, this floral and gingham print features a 4 1/4" cork wrapped heel with 1/4 " platform. The mix of these two prints give this delightful sandal a girlish charm that will soften a sharp denim look and add flirty innocence to a maxi dress or skirt. Fair warning - these may induce the urge to go for walks in the park, attend outdoor movies and concerts, and be a complete darling. How much are these beauties? They're only $54.99!! To grab a pair of these for yourself, click on over to www.endless.com.